RealtyShares recently announced it would no longer be taking on new investors. I don’t expect it to be around in its current form much longer. Passive Income MD asks, Is Real Estate Crowdfunding in Trouble? I invested with RealtyShares and the deal went full circle as planned and I have no regrets. The Semiretired MD has some regrets. My Worst Real Estate Investing Mistakes. A pediatrician reflects on his career as his calling. Or is it? Must a physician feel called to the profession? Pediatrician Finds FI contemplates These Four Words. FIRE. What could possibly go wrong? Michael Dinich, a.k.a. Your Money Geek, has a few ideas. Are You Ready For FIRE or Just Kidding Yourself? Prepare yourself for FIRE better with The White Coat Investor’s Fire Your Financial Advisor Course. Today and tomorrow, he’s offering 15% off with the code CFE2018. See the financial plan of a young white coat / white collar couple based on the course’s teachings. Amy Dacyszyn was writing about FI before blogs even existed. Liz, The Chief Mom Officer, was reading, and I was just focused on being a stellar high school and college student. Who is Amy Dacyszyn Anyway? And can I buy her a vowel? Amy had a focus on saving money. Amy would not have gone to CRNA school. The Student Loan Planner has analyzed many CRNA’s financial situations with a focus on student loan debt and repayment. CRNA Salary: Is it Worth the Student Debt? Ryan Inman of the Financial Residency podcast discusses student loan debt and forgiveness among other topics with a mutual friend of ours. Curbside Consult with White Coat Investor. That was a good interview with a millionaire physician. Here are some more interviews with millionaires, courtesy of ESI Money. Must one have a high income to become a millionaire and achieve financial independence? Not according to the Financial Samurai. Achieving Financial Independence On A Modest Income: $40,000 In Manhattan. With your help, we gave away over $10,000 this week to 100+ charities. I’ve been more generous since becoming financially independent, but my generosity is nothing compared to Michael Peterson’s. He shares his story in a conversation with ChooseFI: Episode 099 | Generous Giving On The Path To FI | Michael Peterson. Last Tuesday, I asked you, my readers, to help me distribute $10,000 from our Fidelity Charitable Donor Advised Fund. Thanks to the recommendations of my site sponsors and you, more than 100 charities will be the recipient of a $100 anonymous gift from our personal stash of donated dollars. These are the charities you chose, and as anticipated, I was able to make all these grants in the matter of a couple of hours on Friday night. By making anonymous grants, we will not end up on the mailing lists, saving them some money in their marketing department, and helping to ensure that the money is used in an efficient manner. We’re providing scholarships for students, finding cures for rare and common diseases, helping military veterans, the homeless, and the abused. We’re buying books, supporting California fire recovery efforts, and building bike paths. Entering these grants one after another after another was a very satisfying experience. Thank you all for your input. Without your requests, we never would have come up with such a wide variety of charities to support around the nation and around the world. I’m not going to lie; I was amazed at how long it took to get these requests. With 28 requests from advertisers, I was looking for 72 recommendations from readers. With a mailing list of nearly 6,000, over 12,000 members between my Physicians on FIRE and fatFIRE Facebook groups, and another 12,000 Twitter followers, I thought the comments section would fill up before breakfast. Instead, it took about 16 hours and a surprising amount of prodding promotion. I know from writing about giving in the past that it’s not a very popular topic, but when I offered to do the giving on the reader’s behalf, I was not expecting such agonizing apathy. Perhaps it was the small hurdle of looking up the charity on Guidestar to give me the link or maybe I wasn’t clear enough that I was actually donating real money to a charity of your choice, but I hope to see a more rapid response if I do something similar next year (which I suspect I will). My initial disappointment turned to joy when I went through the comments one by one, made the grant recommendations online, and realized how successful the experiment really was. Thanks again to those of you who were a part of it. I know most of you are also supporting the charities you recommended to me. I’ve been using the eBates browser extension (there’s also a phone app) to make my Black Friday / Cyber Monday purchases a little sweeter. I’ve had it for a couple years and it integrates seamlessly with your online shopping with a little corner popup to activate savings that range from a couple percent to 20 percent or more. 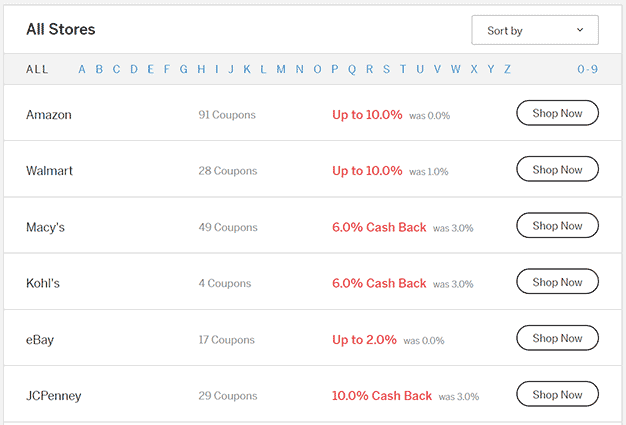 This weekend, they’ve doubled the cash back on many sites. I’ve found it can be especially lucrative for travel sites, with up to 4% back at Hotwire, 10% with Priceline, and 14% back at Orbitz. We just booked our trip to Costa Rica (from which we’ll travel to Honduras for a May medical mission — details coming on Tuesday) and will get $60 back. The discounts stack with other programs like Orbitz’s Orbucks. I’m not sure what’s better. Paying only $1500 for four round trips to Costa Rica or getting $60 back with zero effort. Either way, I’m looking forward to hanging out with monkeys again. To get started with eBates, my referral link will give you $10 right off the bat. My site gets a reward, as well, furthering our charitable mission. I’m proud to present another top-notch firm on my short list of recommended financial advisors. We have only included firms which have the lowest fee structures (i.e. flat fee, hourly rate, no AUM fees) to help lower your costs and help you reach early FI. Physician Family Financial Advisors Inc.
Got kids? Physician moms and doctor dads are happiest when they are treating patients and raising children. That’s why Physician Family Financial Advisors helps busy doctors like you save time and taxes while you pay off student loans, buy a home and set aside all the money you will need for college and retirement. As fee-only financial planners for doctors, we charge a level monthly subscription fee that includes all the financial planning and investment advice you need without conflicts of interest. We are fiduciaries with more than 20 years experience serving families nationwide. No upfront fee. Pay as you go. Cancel anytime. Have an outstanding week! And don’t forget Giving Tuesday! « Is it Time to Take Some Money Off the Table? Thank you so much for your donation to Project Angel Hugs, a small, local charity which helps children in need with health concerns. I am part of a service organization which donates regularly and I have donated personally as well. But we are just a small town, in a flyover state which typically doesn’t matter to most people. I did mention that I had entered their name when I participated in a Thanksgiving parade with them a few spots apart, but I didn’t give them much hope, because all I did was ask, like when does that work? I felt like I won the lottery when I saw your list. So once again on behalf of all who will benefit from this positive organization, Thank you. That’s great to hear, and you’re welcome. You should also thank Ryan Inman of Physician Wealth Services — he recommended the organization. Thanks for writing it. Your honesty was refreshing. Thanks again for making a donation on my (all of us readers) behalf! It was a fun excercise. I’m grateful for your contribution. The CRNA post is interesting. I’m not going to get into the politics of advanced practice providers scope or quality of practice. However, I do feel the “is it worth it” article to be a little tone deaf. They’re talking about 6-7 years of schooling + 1 year working as a critical care nurse to get a salary of 165k plus and debating the worth. The general pediatricians in HCOL areas are starting at less than that for more debt and more opportunity costs (8 years of schooling, and 3 years of residency which is nowhere near as lucrative as being a critical care nurse). The competitive CRNAs who get into the competitive programs and probably have worked for a few years as a nurse in either an OR or critical care setting and probably have even more bank. If we’re saying that 150-200k of debt is not worth it for a salary of 165-200k, what about the opportunity costs to do gen peds, or family med. No wonder we have a doctor shortage…. This is in no way discouraging nurses from doing this. One of the nurses in my PICU has toyed with the idea and I’ve told her to go for it given how lucrative it is. I’m just saying they should recognize the sweet deal they are getting. Thanks again for conceiving and executing such a terrific idea: crowd-sourced charitable giving using PoF’s DAF! And the best part is how it sounds like it didn’t take a lot of effort on your part. Can you imagine how long it would take to send $100 checks to each and every organization on the list above? Not to mention the subsequent paperwork for tax purposes, etc. PS – I had never heard of Guidestar before but that website made “nominating” a charity super easy so thanks for the suggestion. I think if everyone knew how easy it was to just leave a comment with a Guidestar link you may have gotten closer to the quick response times you were hoping for. Looking forward to round 2 if you do this again next year. I hope I’m quick enough!